Day in day out we see ads all over offering everything from a toaster to a car at zero percent finance. And with the advent of EMIs (Equated Monthly Installments), even the middle class can now dream of owning a car; the big and bold 0% finance just makes it all the more tempting. How does the zero percent scheme work? At the outset, what you need to know is that there are ALWAYS hidden costs inbuilt in such schemes. You will also be paying a transaction or processing fee under the zero percent scheme and consequently more money through advance EMIs. For example, you decide to buy a 39-inch LED Full HD television that costs around Rs. 48,000. And of course, the zero percent finance scheme is too tempting to refuse. So, as per this scheme you are required to pay the entire cost in 6 EMIs of Rs. 8,000 each with Rs. 1000 as processing fees. This is a standard charge that all finance companies will charge. What most consumers don’t know is that cash payment entitles the customer to a discount. Let’s say, in this case it is Rs. 2,000. Now here’s how you end up paying more: To begin with you pay a processing fee of Rs. 1,000. And since you are buying the TV on a zero percent finance scheme you are not entitled to the cash discount of Rs. 2,000! So, overall, you will end up paying Rs. 3000 more. By chance if you end up missing an EMI, the interest charges are back-breaking! Yes, companies actually charge anywhere between 24% to 36% as interest charges. To put things in perspective, a car loan is available at around 11.5% and a home loan at around 11%. This is topped with late payment fees and taxes. If you purchase a product on an EMI scheme offered by your credit card company, it is most likely that there will be a pre-closure penalty in the range of 2.5% to 3%. How to decide if the scheme is actually zero percent? It is always better to ask some basic questions to find out if the zero percent schemes are actually zero percent. Find out if you are eligible for any discount if you pay the full amount and if there are any transaction charges for the finance scheme. If the answer is ‘no’ for both the questions then you might consider yourself lucky that the zero percent schemes is actually zero percent. This is as rare as a blue moon though. According to Albert Einstein, Compound Interest is “the greatest mathematical discovery of all time.” Here’s why we think that he may well be right. Compound Interest has the magical ability to generate high returns even from modest savings. It is one of the methods to get rich over a period of time – a much faster method. It is quite straightforward: If you want the most return on your savings or investments, you want compound interest. Amongst the two types of interest you can earn, Simple Interest is paid only on the money you save or invest (the principal), while Compound Interest is paid on your principal plus on the interest you have already earned. 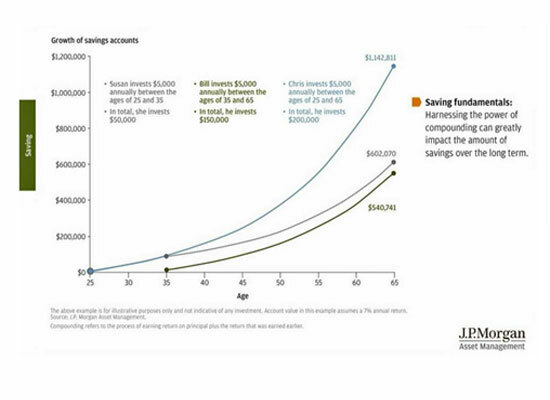 Here we have an interesting chart, courtesy JP Morgan, that shows how returns from savings of 10 years can far outweigh returns from 30 years of savings – with the difference being only in the type of interest. Let’s say you invest today Rs. 10,000 at 6% interest p.a. In a year’s time, you will end up with Rs. 10,000 + Rs. 600 interest = Rs. 10,600 total. So, instead of withdrawing the interest, you re-invest it for another year at the same rate of interest. This would mean at the end of 2 years, you will have Rs. 11,236 (Rs. 10,600 + Rs. 636 interest). The reinvested Rs. 600 gave you an earning of Rs. 36 without you having to do anything. This may seem like a tiny amount initially, but when re-invested over and over on a long term basis, it can accumulate a surprising amount of wealth for you. The funda is simple: It is not just the principal but also the interest that is earning interest for you. Let’s say you invest Rs. 10,000 today and park it into Treasury Bills earning 4% on an average for the next 50 years, you will end up having Rs. 71, 067 if purchases were made through tax-free account. Had you invested in stocks, earning 12% average rate of return as a result of riding out of fluctuations, you would have ended up with Rs. 28,90,022 at the end of 50 years. Adding asset classes giving higher returns would result in 40 times more money thanks to the power of compound interest. The key to getting maximum benefit out of Compound Interest is to start early and invest for a long period. If you are patient, the magic of Compound Interest will amplify the growth of your investment over time. As they say, the right time to start saving is now. The capital is not really important as long as you stay committed to a long term of vision. Leave the rest to the wonder of Compound Interest to work its magic on your savings! Invest in equities via CSB House and have direct access to equity markets-NSE/BSE. CSB offers customized brokerage plans and allows you to choose a plan that fits your trading style, pattern, and investing needs. Knowledge is power. At CSB House, we are committed to empowering consumers with financial knowledge that they can use, apply and share in their everyday lives.